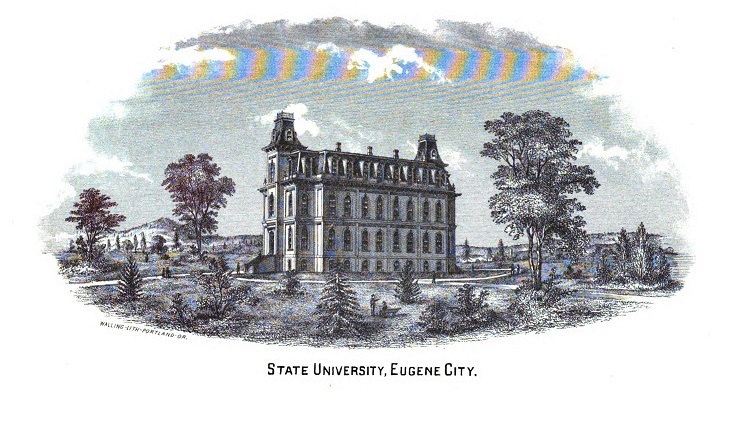 State University, Eugene City. From Illustrated history of Lane County, Oregon by Albert G. Walling, 1884. HathiTrust is a partnership of research libraries, including the University of Oregon, dedicated to the preservation and archiving of human knowledge by building a digital archive of library materials converted from print collections. The Trust currently contains 15 million volumes. Of those, some 38%, or 5.8 million volumes, are in the public domain. Anyone may search the HathiTrust and use the public domain materials. However, logging in as a member provides those in the University of Oregon community additional functionality. That includes the ability to download entire volumes and build shareable collections. Additionally, HathiTrust provides specialized access to students, faculty and staff at the University of Oregon with print disabilities. For best results, log in! 3. Click the arrow in the drop down box and select "University of Oregon"